The future is NOW. And honestly, it looks pretty freaky. Well, Netflix’s sleek, ethically-questionable vision of the future in its upcoming sci-fi adaptation looks pretty freaky, anyway. 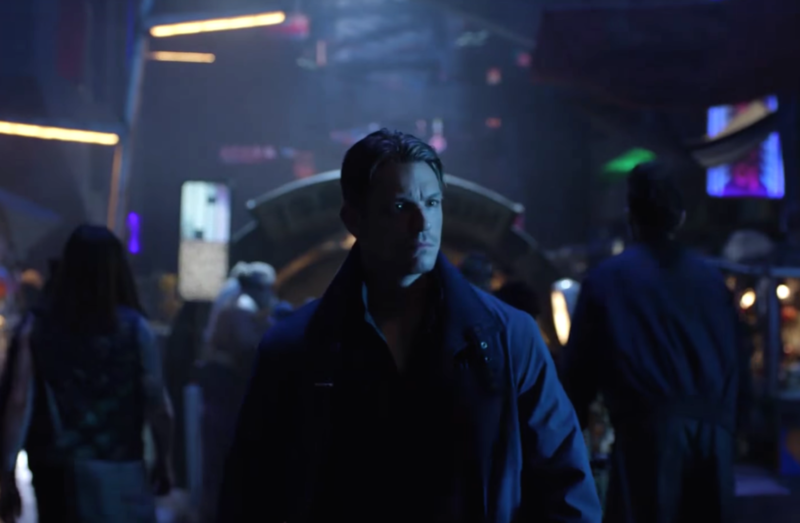 The first trailer for Altered Carbon — what very well may be one of Netflix’s most ambitious (read: expensive) series to date — is here. And it’s already got us on edge. Set hundreds of years in the future, Altered Carbon is a murder mystery cloaked in a cautionary sci-fi tale based on Richard K. Morgan’s 2002 novel. The story follows a soldier/revolutionary/investigator named Takeshi Kovacs (played by Will Yun Lee and Joel Kinnaman) tasked with solving a murder in a shady AF universe where people can now download their consciousness into new bodies, or “sleeves” (so, basically, exactly what Ross Geller described in that one episode of Friends). In fact, the billionaire who enlists Kovacs’s help in cracking the case is looking to figure out who murdered his own former body. Creeped out yet? Us too. Between the ominous infomercial-style voiceover in the trailer and the determined young heroes racing to right injustice in an unjust world, the series has a real Black Mirror meets Blade Runner with a splash of Westworld vibe, which means we’re anticipating some seriously disturbing high-tech nightmares in our future. The 10-episode first season comes from writer/producer Laeta Kalogridis. And the pilot was shot by Miguel Sapochnik, the guy behind Game of Thrones’ showstopping “Battle of the Bastards, so we already know things are going to get pretty epic. "Miguel is a visionary director," Kalogridis told Entertainment Weekly. "You look at ‘Battle of the Bastards,’ he’s able to combine massive scope and scale with intensely emotional human moments — that’s so incredibly rare and Miguel does it like breathing." Check out trailer to see whether you’re ready to upload yourself for some action-adventure. Altered Carbon hits Netflix on February 2nd, 2018.